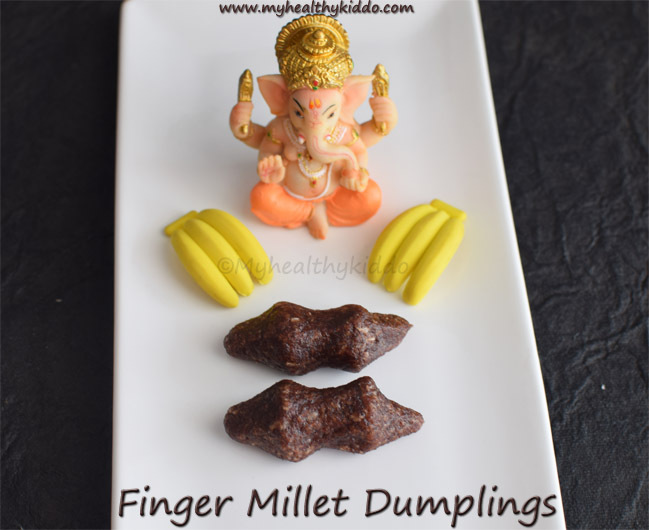 Ragi kozhukattai recipe with step-by-step photos – Ragi kozhukattai/Finger Millet dumpling is a calcium-rich steamed millet sweet. Millet Dumplings are very easy and filling after-school snacks. 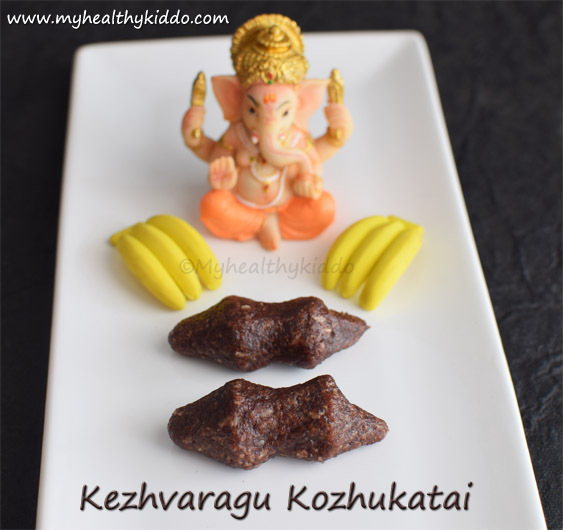 Try making this Ragi kozhukattai and get addicted to it. When a nutritious sweet can be healthy too, why don’t you try it out ?! 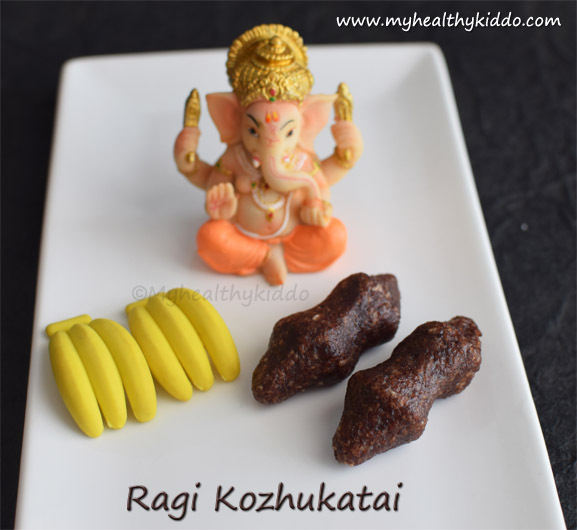 Sweet ragi kozhukattai – Take a trial today and impress Ganesha on his Birthday !! I do make one millet dumpling every week. Check out my earlier posts on Pearl Millet/kambu kozhukattai(here) and Foxtail Millet/Thinai kozhukattai(here). Add ½ cup grated jaggery, ⅓ cup water and a generous pinch of cardamom powder to a pan and let it boil till jaggery completely dissolves in water. In the meantime, in a tbsp of ghee, fry ½ cup grated coconut just till nice aroma wafts around. Add a cup of ragi along with ghee-fried coconut in a mixing bowl. When jaggery dissolves completely in water, immediately switch off the stove. Filter the jaggery water for impurities and add it to the mixng bowl. Mix well to form a soft dough. If the dough is very thick, you will end up in hard dumplings. If the dough is soft, the dumplings too will be very soft. The water I added was perfect for me.. If you feel the dough is tight, sprinkle some more water to make it soft. Pinch out a portion, roughly round it and then press with fingers against the palm to make Ragi pidi kozhukatai. Make dumplings and steam it in idli maker for 15 mins. 1.Do not boil jaggery to thick syrup. It should just be thin as water. Immediately switch off when jaggery completely dissolves in water. 2.The softness of dumpling depends on the dough. If you want hard, use lil water in making jaggery syrup and make the dough stiff. If you want very soft dumplings, use the given measurement for water and sprinkle more if required. Preparation – How to make Ragi Kozhukattai ? 1.Add 1/2 cup grated jaggery, 1/3 cup water and a generous pinch of cardamom powder to a pan and let it boil till jaggery completely dissolves in water. 2.In the meantime, in a tbsp of ghee, fry 1/2 cup grated coconut just till nice aroma wafts around. 3.Add a cup of ragi along with ghee-fried coconut in a mixing bowl. When jaggery dissolves completely in water, immediately switch off the stove. 4.Filter the jaggery water for impurities and add it to the mixng bowl. Mix well to form a soft dough. If the dough is very thick, you will end up in hard dumplings. If the dough is soft, the dumplings too will be very soft. The water I added was perfect for me.. If you feel the dough is tight, sprinkle some more water to make it soft. 5.Pinch out a portion, roughly round it and then press with fingers against the palm to make Ragi pidi kozhukattai. 6.Make dumplings and steam it in idli maker for 15 mins. Do not boil jaggery to thick syrup. It should just be thin as water. Immediately switch off when jaggery completely dissolves in water. The softness of dumpling depends on the dough. If you want hard, use lil water in making jaggery syrup and make the dough stiff. If you want very soft dumplings, use the given measurement for water and sprinkle more if required.